Electricity makes its way to consumers through a combination of transmission & distribution networks. How this is structured typically depends on the regulatory framework in which the network is operated, but in typical deregulated markets a transmission company takes electricity from generating companies. A distribution company then takes electricity from the transmission company and distributes it to consumers. Historically the distribution company also owned electricity meters and managed those assets, but in many jurisdictions the management of the electricity meter is now done by separate metering organizations as they roll out smart meters (often times this is the electricity generating company). ORDITAL recently completed a project with an Electricity Distributor and in this blog post we'll explore the scope of that project, the identified benefits and the challenges involved in doing this at scale. Electromechanical Accumulation Meter - manufactured from approximately 1920 to 2005 and measure the total amount of electricity consumed at the home or business. Electronic Accumulation Meter - manufactured from approximately 1980 and functionally equivalent to Electromechanical Accumulation Meter. Advanced Electronic Meter - manufactured since approximately 2009 and has the ability to monitor and control electricity consumption and conditions in the distribution network. These Smart Meters can be connected to a communications platform to enable remote reading. The rate of adoption of Smart Meters varies from jurisdiction to jurisdiction ranging from those where government programmes have funded a complete change to Smart Meters, to those where there are small scale pilot programmes with only a few thousand meters installed. • PROJECT TEAM LESSONS LEARNED – Lesson 3. Use of GPS, RFID, barcodes and pictures during installation. In most cases, respondents indicated that the lack of documentation from the field was a missed opportunity to improve recordkeeping or to document issues that developed later. • ADDITIONAL LESSONS LEARNED - Lesson 10: Failing to get good data from the field, while installers are in the field, is a mistake. Photos, GPS, and other data should be collected by the field team if reasonably possible. Going back to get it later is expensive. The ORDITAL solution provides a cost effective and reliable method of capturing this information, a sample of which is listed below from our recent project. Location of the meter is critically important as it allows a couple of things to be confirmed. Firstly, capturing the location confirms where the meter is physically installed and that it has not inadvertently been installed at another property. But it also allows the distributor's GIS system to confirm that the meter is connected to the correct transformer in their network. In many jurisdictions the distributor is required to provide written notice of a planned outage and they face significant fines if they don't notify their consumers with sufficient advance warning. If they have meters connected to the wrong transformers in their systems they will fail to properly notify their customers. The ORDITAL solution automatically captures the geolocation and time of capture from the mobile phone when a photo is taken. This information is then passed to the distributor's GIS for network validation. An iPhone's location services use a combination of WiFi crowd sourced locations, cellular triangulation and GPS coordinates to get locations. The ORDITAL solution takes the location directly from the mobile device. As meters drive revenue the information that distributors store on their meter fleet is typically of a lot higher quality than one would experience in other asset intensive industries. However, at the end of the day it is still a human that is maintaining records and reacting to events in the field. If there has been a significant event - such as a major flood - then the field service team will be working around the clock to restore power as their first priority. As they replace meters then the records might not always make their way back into corporate databases despite the best of intentions. The ORDITAL solution utilizes crowdsourcing techniques to extract accurate information on the MAKE, MODEL, SERIAL NUMBER, YEAR, AMPS of the meter that is physically installed at the location. With this information we are able to determine inaccuracies in the distributor's meter database. In the above example the meter database said there was a BAZ meter from EMMCO installed at the location, but in fact there was an M3 meter from EMAIL WESTINGHOUSE installed at the location. Discrepancies were found in approximately 5% of the meter database - some significant - some trivial. Whilst percentage wise this is a small number, if we have a fleet of 2 million meters then this is 100,000 customers that we do not have accurate records for. Also, by having accurate records on the actual meters installed we can dispatch crews to upgrade / service meters with confidence without introducing waste into the process. Whenever humans are involved there is an opportunity for error to creep in regardless of the type of meter installed. A photograph with the ORDITAL solution removes the ambiguity. 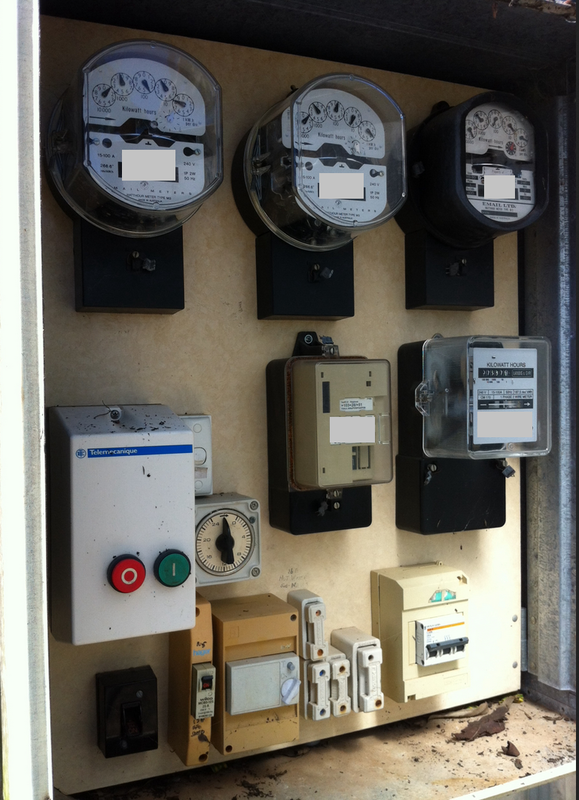 Unlike the electricity meter, the meter box that the meters are installed in remains the property of the owner of the premises in many jurisdictions. This can provide challenges for the owner of the meter when it comes to repairing or replacing their meters. Asbestos was widely used in building materials prior to 1988 and many older meter boxes still contain this material. Given that asbestos is a known carcinogen and that the inhalation of asbestos fibres can cause severe health issues, crews being dispatched to work on these sites should be made aware and appropriate precautions taken. The ORDITAL solution is able to identify the meter boxes that could potentially contain asbestos and submit this relatively small list of meter boxes to the appropriate subject matter experts in the distributor's organization to make precise determinations as to whether there is an asbestos danger present in the meter box. When considering upgrades and equipment replacements it is helpful to understand the availability of space within the meter box. If there is no space within the meter box to add new equipment then work on adding / modifying a meter box would need to be scheduled. However, if there is adequate space in the meter box then it becomes a straightforward matter to send someone out to install that equipment. The ORDITAL solution is able to identify the meter boxes that have space available to install more equipment and the ones that are currently too crowded to install any more equipment. The solution can also identify if the meter box has integrated circuit breakers like the example shown on the right above. With millions of meter boxes in any single electricity distribution jurisdiction the potential for all manner of equipment to be installed in the meter box is significant. The electricity distributor will generally want to know if there is any unauthorized equipment connected into the meter box and whether or not there might be any impact to the network from that unauthorized equipment. The ORDITAL solution is able to identify loose equipment that might potentially be unauthorized additions to the meter box. The solution can look for equipment that is loosely fixed in the meter box with protruding wires connecting it and highlight it for the distributor's subject matter experts to review. If we consider an electricity distributor, or metering organization, with 1 million customers, then a database of approximately 4,000 GB of photographs would need to be compiled to derive the information described above. The technical challenges to achieve this are delivered with the ORDITAL solution. The main challenge is organizational - who will you get to take the photos? If the organization sends out a dedicated team to perform this work it will become prohibitively expensive and the return on investment will not be realized. The data capture needs to be carried out by the teams that already visit your meters. These are those individuals installing or maintaining the meter, or more likely the meter readers. Many electricity distributors have teams of contractors that go out and physically read the meters at varying intervals - typically every 3 months to feed into a quarterly billing cycle. Meter readers in many jurisdictions will average about 300 premises per day. So if there are 1 million premises to read in 3 months you will need a team of just over 40 meter readers to complete that work. The experience from our project is that if we ask the meter readers to take photos in addition to their normal meter reading work flow then it will slow them down by approximately 15%. So instead of averaging 300 premises per day it is more like 255 per day. The options available to an organization will depend on discussions with the meter reading contractor. However, experience to date indicates that it is probably unlikely that the contractor would be keen to ramp up their meter reading team for a one off 3 month effort. What is more likely to succeed is to ramp up over a longer period - say 12 months - to capture all meters. There may be benefits in making this a continuous improvement exercise and continuing the capture of photographs on an on-going basis every 12 months. If we look back at the example of 1 million premises with just over 40 meter readers. We could have 1/4 of that team taking photos and add 2-3 people to that team capturing photos. The team taking photos would work over the period of a year to capture 100% of the meter fleet. This avoids the metering contractor having to ramp up significantly for a short period of work. The feasibility of any approach needs to be discussed with the meter reading contractor and is the single most important part of the success of this approach. Once you have agreed who will take photos and how long they have to do it, the rest is straightforward.